(Pacific City, Oregon) - Along the Three Capes Tour, Pacific City's Haystack Rock is one of those most recognizable of Oregon coast landmarks, a part of generations of memories from vacationers going back decades now (although little Pacific City was a very off-the-beaten-track destination until the 90's when a business boom kicked in, and then the hordes of tourists ensued). Different times create drastically different views of the geologic icon. 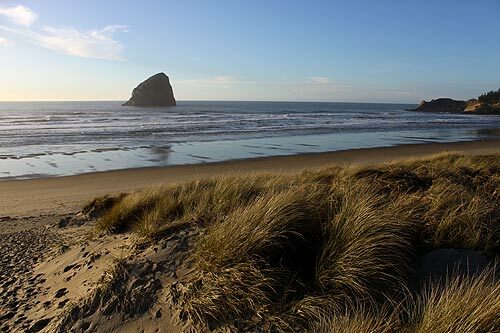 On sunny but cold winter days, the beachgrass is the only thing in vibrant bloom. 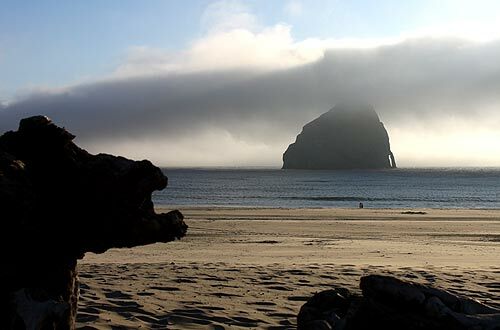 Still just offshore, no matter the season, Haystack Rock is seen here from the southern end of the beaches. During the summer the sky is a bit richer in color, even on wispy days like this when a mysterious cloud formation loiters just offshore. 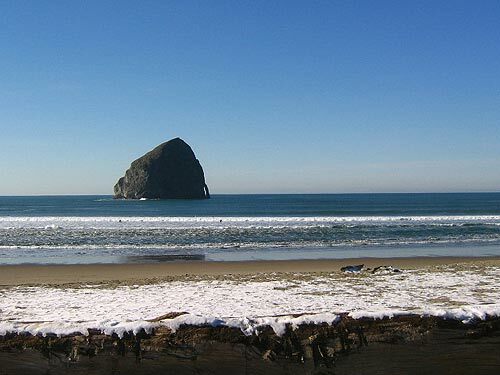 You may even wonder what Cape Kiwanda looks like in the snow. Here it is just after a snow storm in early 2007 â€“ a rare sight indeed. At night, the ancient sentinel of the near-shore bathes in ethereal purples and yellows â€“ a variety of shades not visible to the human eye because cameras see things we don't. 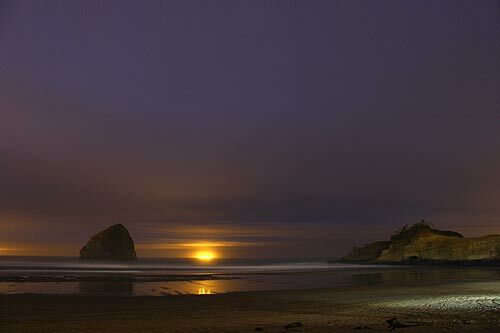 There is another Haystack Rock at Cannon Beach, almost 100 miles to the north.